When Chicago building owners think about their plumbing systems, they tend to think about their potable water lines and the drain lines leading from their sinks, showers, bathtubs and floor drains. Left out of the equation are the vertical rain drains. Here at Nu Flow of Chicago, we want you to feel confident in the durability and longevity of all your plumbing pipes, including your vertical roof drains. This is why we offer inner pipe lining services for all types of potable water lines and drain lines, including vertical stacks. Your building’s storm drainage system includes vertical roof drains that channel storm water from the roof of your building down and into the municipality’s storm drainage system. This helps prevent soil erosion and protects the foundation of your building from water damage. 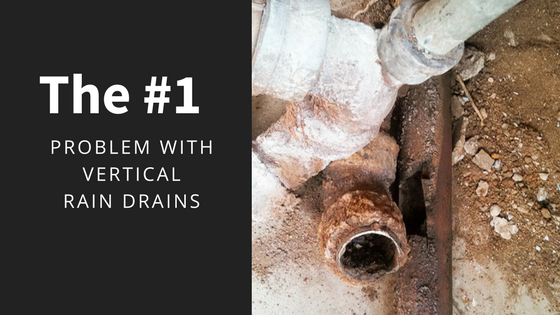 Unfortunately, these drains are often hidden behind walls where they cannot be easily viewed, and since they are not connected to a plumbing fixture, they are often forgotten until water spots are noticed on the walls and ceilings. The number one problem with vertical rain drains is longitudinal cracks, which are cracks or splits in the material of the plumbing pipe that run the length of the pipe. These cracks can occur as the result of corrosion over time or as a result of the building shifting and settling after it is built. Once the cracks form, rainwater can exit the crack and leak onto the drywall of other building materials surrounding the drain stack, causing mold, mildew and expensive water damage. Thankfully, epoxy pipe lining can seal longitudinal cracks in all types of vertical drain stacks, including cast iron. A building pipe assessment of your vertical drain stacks can help detect longitudinal cracks in your storm drain plumbing system and help you determine if an inner pipe lining would help seal the cracks, prevent future corrosion and increase the useful life of your drain pipe. In fact, we’ve recently completed lining a corroded pantry drain pipe in a Chicago building. The pipe was severely corroded to the point where the pipe’s internal diameter was being negatively affected. Our pipe lining technicians cleaned and smoothed the interior of the pipe in preparation for the installation of the epoxy pipe liner. Then, the liner was prepared, installed and left to cure. Once cured, the liner seals the cracks in the pipe and prevents further corrosion, which increases the drain stack’s useful life. To learn more about our epoxy coatings and epoxy liners for potable water and drain lines, call us at 815-790-9000. We would be happy to talk to you about the benefits of internal pipe liners and schedule a whole building pipe assessment.